Welcome To The Country With The Biggest Crush On America : Parallels Here's why Kosovo — land of Bill Clinton Boulevard, pets named Trump and a pantsuit boutique called Hillary — gives the United States its highest ratings. 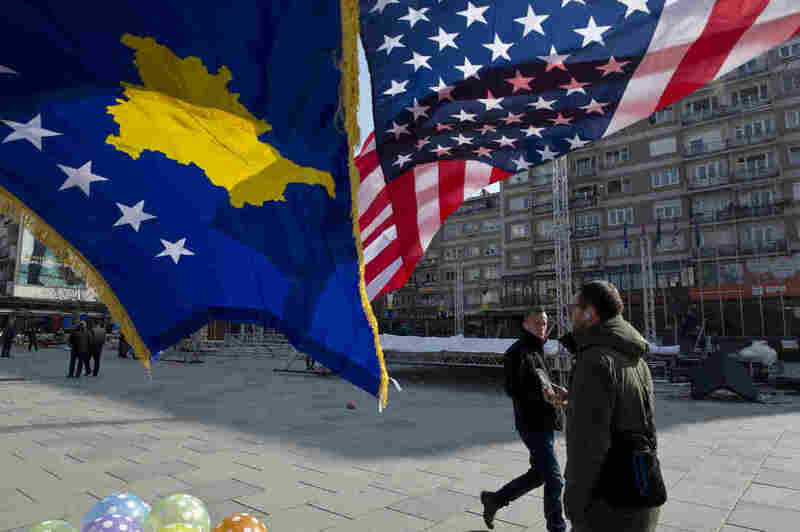 Kosovo and U.S. flags decorate the main square in Pristina, Kosovo, on Feb. 17, on the 10th anniversary of the country's independence from Serbia. 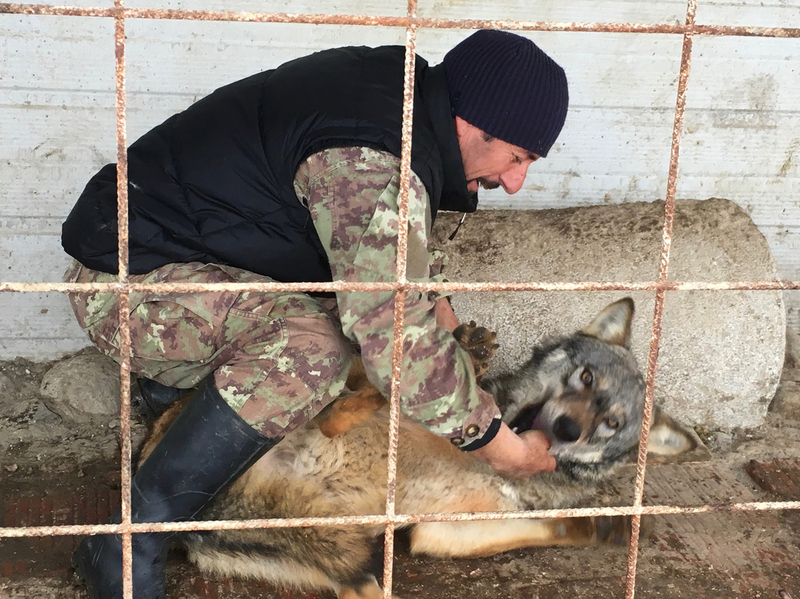 "You see, Trump Wolf protects me," says Rexha from inside the cage, snuggling his wolf. "Just like President Trump will protect Kosovo." Hysni Rexha, 51, is a farmer in western Kosovo. He named his favorite wolf after Donald Trump. This loyalty has its roots in the brutal 1998-1999 war with Serbia. The war claimed the lives of more than 13,000 people, most of them ethnic Albanians. More than 1.4 million were displaced from their homes. Thousands of women were raped. The United States led NATO airstrikes that drove away Serbian strongman Slobodan Milosevic's army. "We've been through a situation where our people were at risk of being exterminated, and it was the U.S. that stood by us," says Vjosa Osmani, a lawyer and member of Kosovo's parliament. "It's extremely important that no matter who the president of the United States is, that we keep that bond strong. Most Kosovars are careful not to criticize President Trump, though they rooted for Hillary Clinton in the 2016 election. Her husband was president during the NATO strikes and remains a revered figure here. In Pristina, on Bill Clinton Boulevard, there's an 11-foot statue of former President Clinton, waving and holding documents engraved with the date NATO started bombing Serbia. Next to the statue is a boutique called Hillary, with a whole rack of pantsuits. "Kosovo will always hold a special place in my heart," Bill Clinton said in a video message for the country's 10th birthday, which was on Feb. 17. There are Kosovars named Klinton and Hillari, but there's also a boulevard dedicated to George W. Bush, who backed Kosovo when it officially declared independence in 2008. And there's Bob Dole Street, dedicated to the long-serving Republican former congressman. The Wesley Clark Driving School pays homage to the retired U.S. Army general who led NATO during the Kosovo War. There's a replica of the Statue of Liberty atop Hotel Victory. And Beau Biden Roadway is named after the late son of former Vice President Biden, outside Camp Bondsteel, the U.S. airbase in Kosovo. "And have you heard the America song?" said Adelina Berisha, a 32-year-old psychologist, before shout-singing, "USA, USA, for Albanians light of day!" The song is "Amerike," a spicy dance jig by Kosovar folk singer Shkurte Fejza. Berisha prefers it over the "too dramatic" "Thank You USA," a ballad by pop singer Armend Miftari with lyrics like "you are my best friend, you are the peacekeeper, you are the legend." Arjgend Haxhiu, a 25-year-old programmer and designer in Pristina, says U.S. support helps him feel less isolated. "The EU leaders do not want Kosovo in the EU," he says. "We lose in every negotiation with them, no matter what we do." Kosovo wants to join the EU but the bloc is divided on supporting its membership. It's the only Western Balkan country that does not have a visa-free arrangement with the EU. "If there were unity in the EU for Kosovo," President Hashim Thaci recently told the Munich Security Conference, "I'm convinced that the state of Kosovo would be a more sustainable and stable country." Five member states — Cyprus, Greece, Romania, Slovakia and Spain — don't recognize Kosovo. Spain, rattled by the Catalan separatist crisis, refuses to recognize Kosovo because Serbia, which also wants to join the EU, considers it a breakaway province. Nearly 80,000 ethnic Serbs live in northern Kosovo, a lawless region allied with the Serbian government in Belgrade, which has strong ties with the Kremlin. In the divided city of Mitrovica, there's a sign that reads: "Kosovo is Serbia — Crimea is Russia." Last month, Oliver Ivanovic, a popular Kosovar Serb politician who criticized Belgrade's influence and wanted to work with ethnic Albanians, was gunned down mafia-style outside his Mitrovica office. Organized crime is rampant. "The people [in Mitrovica] are not afraid of Albanians, but Serbs, the local bullies and gangsters riding SUVs with no license plates," he told the Serbian magazine Vreme last year. The EU told Serbia it can join by 2025 — but only if it carries out reforms and works out its differences with Kosovo. German Foreign Minister Sigmar Gabriel said he supports Serbia's candidacy only if it recognizes Kosovo and deals with "nonfunctional" northern Kosovo. Kosovo is predominantly Muslim. But Serbian President Aleksandar Vucic says Serbs see Kosovo as the cradle of their Orthodox Christian faith and won't let it go. When Kosovo officially celebrated its 10th birthday on Feb. 17 some 300,000 people crowded central Pristina for a concert by Kosovo-born British singer Rita Ora. In Europe's youngest country, which is struggling to move into a modern narrative and identity, Ora and other successful young Kosovars are considered the country's best hope. They include the country's first two Olympians — skier Albin Tahiri, who's competing in the Pyeongchang Winter Games, and judoka Majlinda Kelmendi, who won gold in the Rio Games in 2016. But Kosovo faces huge problems as it enters its second decade. Several residents who spoke to NPR earlier this month complained about systemic corruption. And in Pristina, glum Kosovars inhaling the smoky air said the black smog over the city is caused by cheap lignite coal-fired power plants. Air pollution is so bad it's caused protests. There's also a sense that, politically, the country is stuck in the past and run by compromised politicians. Kosovo's current leaders — Thaci and Prime Minister Ramush Haradinaj — are throwbacks to the 1990s, both former Kosovo Liberation Army officers who fought the Serbian Army. Serbia wants to extradite Haradinaj to be tried for war crimes. Thaci has been accused of involvement in an organ-trafficking ring. (He denies the allegations.) Their supporters recently angered the United States and the EU by trying to scrap a special court to try former KLA fighters for wartime and postwar crimes. Then there's the economic stagnation. Kosovo is largely dependent on foreign aid. The average monthly wage is about $430, forcing many Kosovars to work overseas and send remittances home. Unemployment hovers between 30-35 percent, rising to nearly 60 percent among young people. More than half of Kosovo's population is under age 25. "They're offered money to join these terrorist networks without realizing what's involved," says Besnik Leka, who works for CARE International, a nongovernmental aid group that's reaching out to isolated young Kosovars, especially in rural areas, who are at risk of radicalization. "We need to find a way to engage them." Because the job market is so grim, many leave the country. In 2015, thousands of young Kosovars slipped into Western Europe to seek asylum, in the hopes of finding work. That year in Germany, I met a multilingual young Kosovar journalist living in a refugee camp in Baden-Wurttenburg that was filled with Syrians. Though his asylum request was eventually rejected, he managed to save money for his wife and infant daughter by working under-the-table jobs. The best and brightest study in the West — and often don't return. Rina Gosalci, 22, won a scholarship to study neuropsychology in Greece and hopes to go to graduate school in Germany. She speaks flawless English and is fluent in U.S. politics and history. But when I ask her if she'd like to eventually settle in the United States — Kosovo's "best friend" — she shakes her head. "Too many school shootings there," she says. "I'm grateful to the U.S., but maybe Canada is a better place to live."